Finally, I saw Old Faithful. I didn’t actually take a photo of it, of course. The weather was pretty un-photography friendly when me and my parents sauntered over to the geyser to await the eruption, and I didn’t think I’d bother bringing my camera, lenses and tripod with me .. the 50 yard haul surely couldn’t be worth it. About 2 minutes before the geyser erupted, the sun popped out from behind the clouds, and the clouds behind the geyser parted, and we got blue sky and direct sun on the eruption. I shot a few snaps on my parents little point and shoot digital camera, but regret not bringing my gear with me. Silly, silly boy! 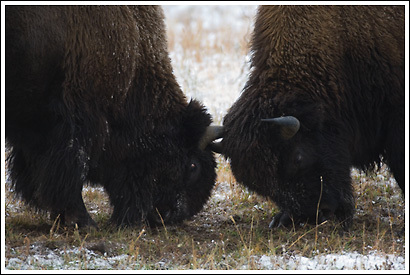 As a result, I’ll post this bison photo from the previous day’s outing. I think my mum made me photograph each and every single bison in the entire park. As a result, I took a LOT of bison photos. We saw and photographed elk, a couple of mule deer, and also saw coyotes, black bear, geese, and so on. I’ll post a list of wildlife my folks got to see on the trip shortly. We visited a bunch of hot springs and geysers today, and they were interesting. I hadn’t really checked them out too much on prior trips to Yellowstone, but felt I better show them to my parents. The day today was cold and windy and snowy, so the warm air coming off the hot springs was a welcome respite. We headed on further south, after the Old Faithful visit and are now camped in Grand Teton National Park. The weather’s not really hooking us up, so maybe I’ll post a picture later from my trip here last year. I think we have tomorrow and the following morning here, then head over to Seattle, where I sa goodbye to my parents, and they head on to Eugene, Oregon for a couple of days, then to San Francisco, and then home to Australia. I fly directly from Seattle to Anchorage, where I’ll start editing a summer’s worth of photos, and catching up a bunch of computer work – boring! This entry was posted in Adventures, Travel, Wildlife, Wyoming on October 5, 2007 by Carl D.